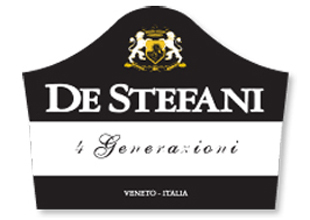 The De Stefani family originates in 1624 Refrontolo, a little hilly village in Veneto Italy. In the second half of 1800 Valeriano De Stefani, the founder, individualized the best soil where to produce wines with rare personality in the Colvendrame estate in Refrontolo, on the hills between Conegliano and Valdobbiadene, north of Venice. His son Valeriano, second generation, inspired by his careful wife Angelina, began the tradition which the De Stefanis have always adhered: total devotion to quality with no compromise. Tiziano, third generation brought important innovations in vineyard management and in vinification. In the Le Ronche estate in Fossalta di Piave the vinification, ageing and sales center of the winery are located. The Veneto, located in the north-east of Italy, is a region that contributes a significant percentage, nearly a quarter, of the country’s total wine industry. Several of the major DOCs, including Soave, Bianco di Custoza, Valpolicella and Bardolino, plus Amarone, are produced here. The beloved sparkling wine Prosecco (Glera), while produced all over the country, has its origins and its best expression in the Veneto and is its own DOC. Veneto is comprised of many different terrains and microclimates, which account for its range of varietals and styles. With fruity red Valpolicella complementing its intense Amarone and sweet Recioto counterparts, Veneto is armed with a formidable portfolio of red wines to complement its refreshing white and sparkling wines. There are 24 DOCs within the region, even the historic canal city of Venice has its own DOC (Venezia).